Oh my goodness, NO. There are plenty of other great 5k runs our there to test speed and performance. We’re all about a colour crazy day out with friends and family. You can run, walk, jog, skip, dance or cartwheel it if you wish! Do children have to pay for the registration? Children 5 or under receive a free entry in the event but this does not include a t-shirt or race pack. They are more than welcome to wear their own white t-shirts or even a costume! Alternatively, you could purchase a cute children’s size T-shirt and a race number. There are no age limits, if they can cover running, jogging, walking or strolling the 5kms of the course, they can absolutely do The Color Run! Anyone under 14 years old needs to be accompanied by an adult. No, we are a commercial fun run event, but we do work with charities. You can pick up your kit at the Pre-Pickup store that opens in the week leading up to your event. Opening hours will be advertised closer to the event. How is the colour administered? 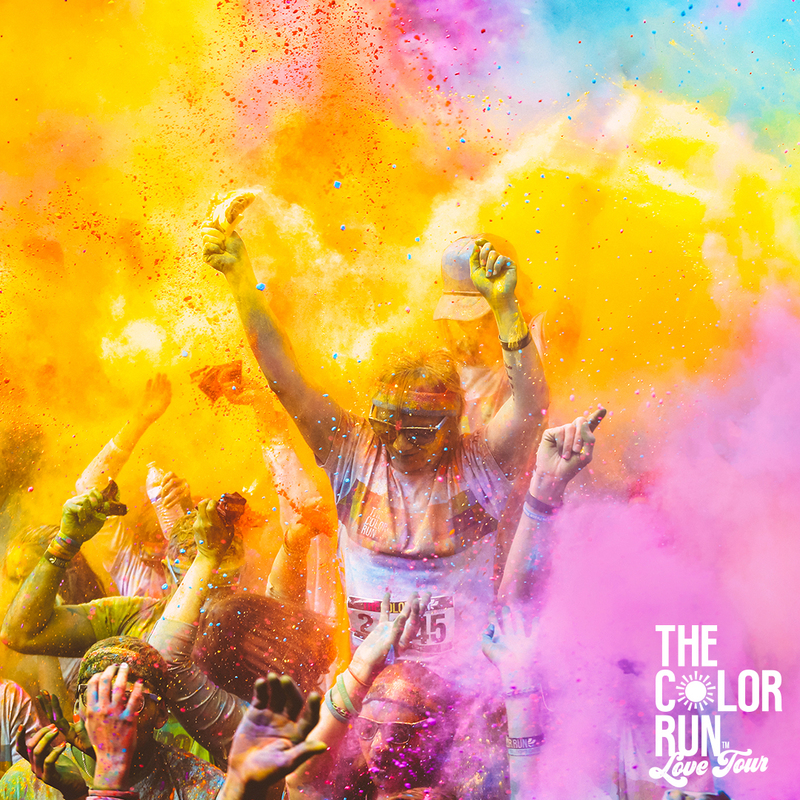 You will see smiling faces along the course whose main goal is to douse you with colourful powder to ensure that you look like you ran through a beautiful rainbow by the time you cross the finish line! Will the colour stain my hair? The coloured powder does wash out of your hair; however, we do recommend you take precautions if you are worried! The colour does tend to stick to lighter hair. Blondes you are warned! Oiling your hair before the run will help the colour wash out. If you’re having trouble washing it after the event, bi-carb soda and anti-dandruff shampoo will help get the more stubborn colour out! The colour mostly washes out after the event. However, as with anything dirty, the sooner the gear gets washed the better. Dust off all excess powder before washing with water. Wash your coloured gear separately and use cold water. We suggest wearing items that you would not mind getting colourful. If you would like to preserve the colour in your running shirt, we suggest spraying it with vinegar and ironing it when you get home. This is the most likely way the shirt will retain its colouring. How does the colour affect the inside of cars? You went all out, you are covered in colour and if you do not take precautions, your car will be too. If you are driving or taking the tube, use your poncho or bring something (towels, plastic, rubbish bags, etc.) to cover the seats before you sit down. re cameras and phones safe to have in the Color Zones? Our race photographers are totally fine shooting from a medium distance (10-15metres). If you want to get shots right in the midst of the colour we recommend covering cameras/phones with cling film or placing your phone in a ziplock bag. The coloured powder used at the event is made from food-grade cornstarch. It is 100% natural and causes no harm to skin or the environment. The powder used in its events has been tested for flammability and successfully passed the required EU standards. As with any substance, you want to keep it out of your eyes and our colour throwers make sure to aim low as you pass by. Some Color Runners opt to wear glasses or goggles for their eyes and use a bandana or dust mask for their mouths. Absolutely! You may want to warn them though they’re not coming out of The Color Run Finish Festival clean! If an event is held as advertised, we cannot issue refunds. The logistics of setting up and planning the event make it impossible. You can transfer your place to another participant if you can’t attend. How strict is the “white clothing dress code” for the start of the event? We will have white clothing police inspectors located throughout the event. You will be arrested and put in jail if more than 11.8% of your person is a color other than white just like at Wimbledon, honest! Just kidding, you can wear whatever you feel comfortable in to run, walk or skip around the 5k course. How does the start chute work? The start chute will open 15 minutes before the run commences. We will then let everyone onto the course in waves of approx. 500-800 every 3-6 minutes. We do suggest any serious runners make their way into the chute early so they can be among the first group to enter the course. The Color Run is an outdoor event so could be affected by weather! The event will not be cancelled in bad weather unless it is unsafe to proceed. Rain is, after all, just liquid sunshine! Can I take photos or film at the event? Why do you keep spelling colour the American way? The Color Run is an American brand that has arrived in the UK so it is missing the Brittish u. We like to encourage all our Color Runners to put the u in colour on the day, and use our UK #ColourMeHappy. Can I run with a jogging buggy and my kids? On one condition, if you are prepared to be one of the hippest mums/dads on the planet! As long as they are cute and like to have funâ€¦all kids 5 and under can run with an adult FREE of charge! Be sure to register them through the entry page. All of our courses are accessible, so everyone can enjoy the ‘Happiest 5K on the Planet!’ We suggest an all-terrain wheelchair or to bring a friend along who will be able to help you through more tricky parts of the course. Can I bring my scooter or bike? Unfortunately, due to safety reasons, the only wheels we allow at our events are prams and wheelchairs. Sorry! Please email info.uk@thecolorrun.com and we’ll hook you up with an answer. If your question is awesome enough, we might even publish it right here on The Color Run Official FAQs page.